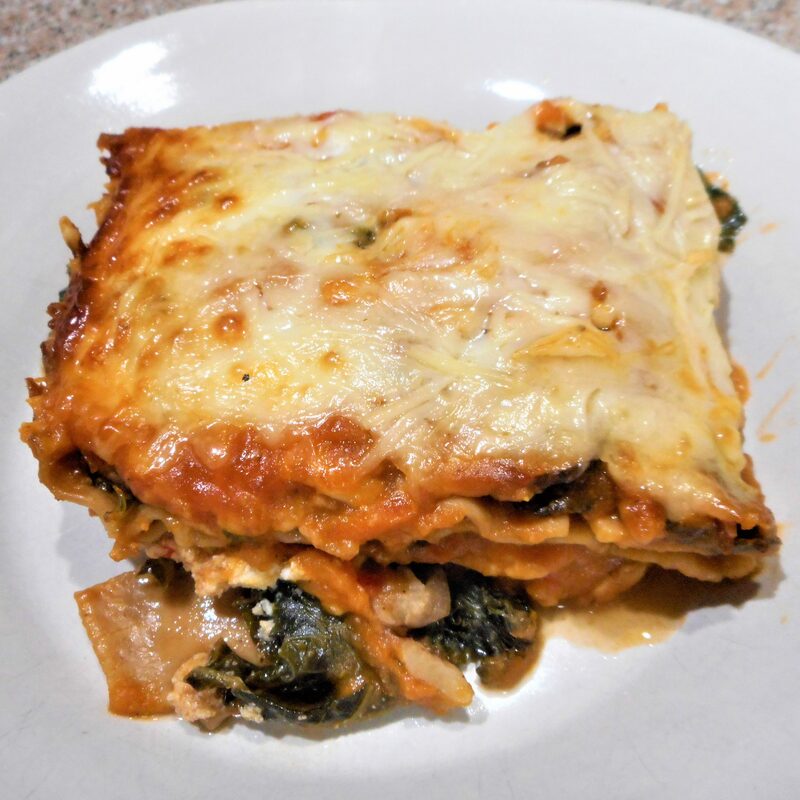 This butternut lasagna makes a delightful meatless main dish, but is also an excellent side dish with grilled chicken. You may save time by using jarred butternut pasta sauce and adding in the cheeses. 2. Combine the squash, broth, milk, and garlic in a medium saucepan and bring to a boil. Reduce heat to medium and simmer until the squash is tender (about 20 minutes). Remove from heat and add the salt, pepper and nutmeg. 3. Using an immersion blender or working in batches with a conventional blender, blend the squash mixture until smooth. 4. Place the hot blended squash mixture in a bowl and add the gruyere cheese and half of the mozzarella cheese, stirring until the cheese melts and mixture is smooth. Set aside. 5. Heat a large skillet over medium heat. Add oil to pan and swirl to coat. Add the onion and mushrooms and cook until the mushrooms are browned and the liquid evaporates. Add the kale and 1 tablespoon broth or water. Cover and cook until the kale wilts. 6. Place the kale mixture in a fine sieve to drain 5 minutes, then remove the mixture to a bowl and add the walnuts, tossing to combine. 7. Spread 1/2 cup of the squash sauce in the bottom of a 11 x 7-inch baking dish coated with cooking spray. Arrange 3 noodles over the sauce and top with half of the kale mixture. Dollop ricotta cheese on top of the kale. Spread half of remaining sauce over top. Arrange 3 noodles over the sauce and top with the remaining kale mixture, then top with the remaining sauce. Sprinkle evenly with the remaining half of the mozzarella cheese and the Parmesan cheese. 8. Cover with foil coated with cooking spray. Bake at 375° for 35 minutes. Uncover and bake an additional 10 minutes or until bubbly and the cheese is golden brown. 9. Remove from the oven and let stand 10 minutes before cutting to serve.